The four muscles that raise and lower the arm (and their respective tendons) are collectively known as the rotator cuff . The rotator cuff lies under the roof of the shoulder (an extension of the shoulder blade known as the acromion ). 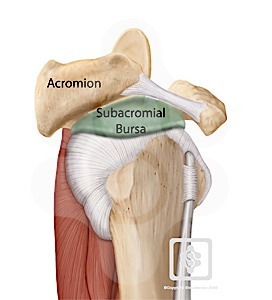 The space between the acromion and the rotator cuff tendons is filled by the subacromial bursa . This bursa is a fluid filled sac that allows for smooth gliding of the rotator cuff under the acromion with overhead movements of the shoulder. The rotator cuff works a depressor and centraliser of the humeral head in the glenohumeral joint. As the arm is elevated the rotator cuff depresses the humeral head allowing it to glide easily underneath the acromion. A tendonopathy due to chronic overuse. Abnormal muscle patterning problems of the shoulder. The acromion differs in individuals normally (morphological variants). These were described by Bigliani as type I, type II or type III. Type I is flat, type II is curved and type III hooked. A person with a type II or type III acromion would be at a higher risk of impingement due to the narrowing of the acromiohumeral gap and bursal space. 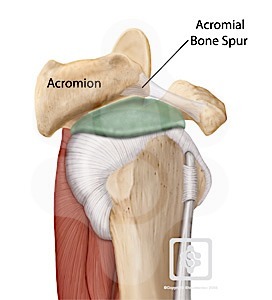 In addition to the above, with advancing age people tend to develop a bone spur on the front and side of the acromion. This further reduces the subacromial space increasing the risk of impingement. 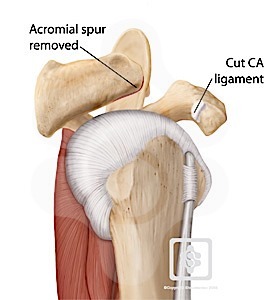 Therefore somebody with a rotator cuff injury who has a type III acromion and is their 50’s has a very high risk of developing significant impingement compared to a patient in their 20’s sustaining a supraspinatus strain who may have a type I acromion and no spurs. The rotator cuff and acromion will then rub against one another, causing a painful condition known as impingement. Each time the arm is raised there is a bit of rubbing on the tendons and the bursa between the tendons and the acromion, which may cause pain and inflammation. Impingement may become a serious problem for some people and disturb their normal activities. This is when treatment is needed. Strengthen your shoulders and do not try to play or work through the pain.